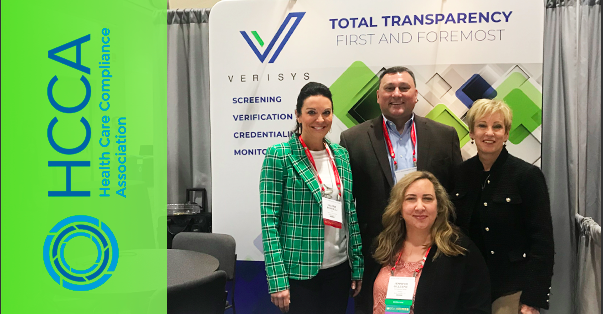 The Verisys team had the pleasure of attending, exhibiting, presenting and moderating a panel at HCCA’s Compliance Institute in Boston this week. We opened the conference with Verisys’ Compliance Officer, Jennifer Gillespie and VP of Operations, Amy Andersen presenting together the session: WHAT BIG DATA REVEALS ABOUT COMPLIANCE ADHERENCE AND HOW TO LAUNCH AND SUSTAIN A COMPLIANCE-DRIVEN CULTURE WITHIN YOUR ORGANIZATION on Sunday, April 7th. They identified common pitfalls in compliance policy, education and enforcement, and shared techniques to best leverage compliance data and processes within one’s organization to create efficiencies for business impact, a global compliance culture and central access to real-time data. Later that day, Valerie Mondelli, RPh, MBA, Chief Revenue Officer of Verisys Corporation, moderated the panel discussion: EXAMINING THE FOUNDATIONAL FEATURES OF A PATIENT PROTECTION-DRIVEN COMPLIANCE PROGRAM. She guided the panel of experts (Beverly Craig, Herman Williams and Jennifer Gillespie) into meaningful discussion of the evolution of compliance as a career path, how new regulations and health care delivery methods affect the role of compliance, and the importance of a solid compliance program on the mitigation of fraud, waste and abuse. With so many great sessions, panels and tracks this year, the hottest topics circled around the discussions on Post-Acute Care Credentialing, Continuous Compliance and Monitoring, Compliance in Hospice and Home Care, Privacy and Compliance When Navigating Mental Health and Substance Abuse, and the Importance of Building a Culture of Integrity. Our highly attended panel and morning session led to many great conversations back at our booth (#500) in the exhibit hall. We enjoyed addressing the health care compliance issues many of you are currently facing and the importance of having a streamlined, cloud-based credentialing process to ensure continuous compliance and monitoring to protect patients and drive successful outcomes, as well as reduce fraud, waste and abuse in one’s organization. It was a pleasure meeting with many of you this year at HCCA’s 23rd Annual Compliance Institute in Boston. We are looking forward to all of the post-conference conversations that many of you have scheduled with us over the next several weeks.